The spot gold price continues its bullish path, climbing ever closer towards the high of June in a series of small steps. Yesterday’s narrow spread up candle was underpinned by a deep shadow to the lower body further evidencing this positive sentiment for gold at present with the 9 day moving average providing solid support as a result. 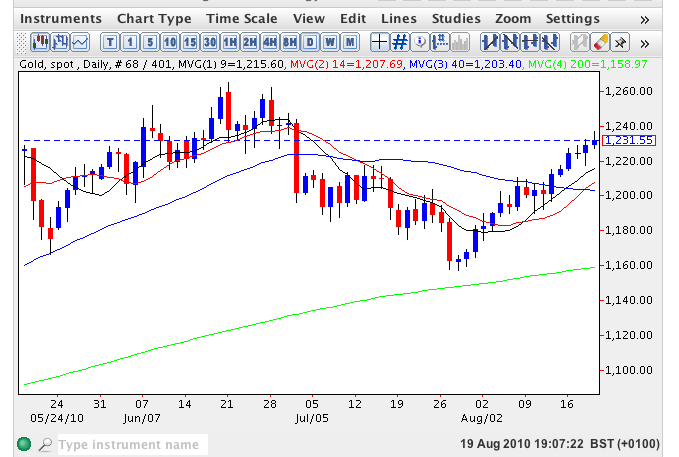 With spot gold trading at 1232.20 at time of writing and with the 14 day moving average now crossing above the 40 day moving average this is adding further to the bullish picture and should equities come “off the boil” as seems likely in the short term, then this could provide further momentum for the upwards trend.